Cooking 4 all Seasons: Dosa of this kind and that ~ 101 Dosa Varieties! Dosas are my favorite! I think I have spoken enough on this that I need not say much. Still if I got to elaborate, I can talk endless on Dosas and what it does to me. For quite a long period, when parottas were not really introduced to me, I always used to order Dosa in a restaurant. Dad used to ask why I would want to order dosa when every other day it is for breakfast at home. Still I never used fail in my taste. This continued to be my standard order until I started loving Parotta. How many ever times you make at home, still the aroma of a dosa on a tawa is incomparable. The earliest memories of Dosa on tawa must be during my childhood days. During summer vacation while in school, we used to visit ammamma's house. Our stays were never longer than 3 to 4 days, so we used to enjoy the maximum possible. My mom's family is a big one with 6 sisters and a brother. During that time, most of them were not married and hence all were at home. We all used to sleep in the terrace and we kids used to sleep through morning.By then, Ammamma would've started the breakfast preparation. The kitchen's chimney used to be a big hole which opens naturally from the terrace and through this, the smell of dosa getting cooked on the tawa sneaks out through the chimney. That memory is still so fresh that I can even now as I am writing this, can smell it in my mind. Such potent Aroma! Nothing can surpass that! It would be around 8 or 8.30, but still the climate would be kind of chill and not the hot scorching sun that comes out latter part of the day. We rush down to fresh up and straight go attach the dosas. Ammamma would've made ground nut chutney and wow it used to taste to heavenly. Amma, as I said has this on menu almost some 3 to 4 times a week as I love it. Still that aroma of dosa on a iron tawa in a stove lit using the logs, is something unique. Those days there was no gas stove and they used wood for cooking. So the smoky smell from the wood gets mixed with the tantalizing dosa getting cooked. Its like the burnt Chinese Fried rice, you never actually get the exact taste if you don't burn it. Well years later, I still remember those days as a child I spent in my grandparents home, enjoying the simplest of food, yet nothing was more satisfying. Even now dosas are my favorite. And am happy that my konda is also fond of it. I do hope my twins too like it. Hubby dear at times complains that Konda has so much of my taste. But I think she has best of us in her, which makes me glad. 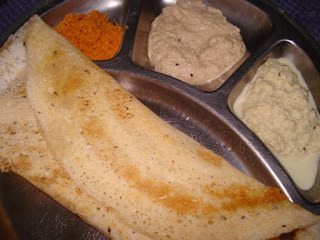 Though I wanted to record 101 varieties of dosa here, I haven't really recorded the basic proportion given by Amma. Anyone can make a dosa when given the batter, but to get the perfect one, makes an expert. The way you spread the batter on the tawa, how thin or how thick all comes out of experience. 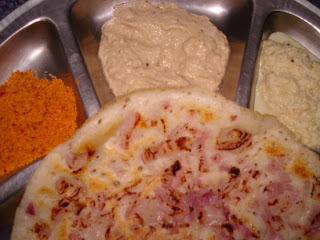 Amma makes lovely 'Kal Dosa' which is a soft with lot of holes on the top. That's something so wonderful. Its the same batter that she makes, yet she gets Paper Roast and Kal Dosa out of it. *Measurement can be understood as whatever cup you used for rice, use the same one to measure the Urud dal. Clean and Soak the rice along with urud dal for 6 hrs maximum. This is for grinding in a grinder. If you are going to use mixie, you got to soak for some more time. Then grind everything together to a smooth batter. This has to be done with adding enough water to get a smooth batter. Add salt and let it ferment over night. Once its fermented well, the batter would have doubled its size. Beat it well and don't add water at this stage. The consistency will be really thick. Use only what is required, rest of the fermented batter can be stored in fridge for later use. If stored in room temperature, the batter tends to get soured. But when you store in refrigerator, the batter can be fresh for a week. Before using the batter, mix 1/2 cup water and a pinch of soda if required, to the batter you are going to use, return back the batter to fridge. Mix well. Heat a tawa, and take a ladleful of batter and once the tawa is hot, you can spread as a circle movement. Clockwise or Anti clock wise is your choice. Amma makes it Anti Clock wise. You can check if the tawa is hot, by sprinkling water on it. For Paper roast, take less than a ladleful and spread it really thin. Sprinkle Oil or Ghee and simmer it. If you are using non-stick pan, let it come up. Then you can turn over and cook on the other side. If its a regular iron pan, you can cut half an Onion and dip in oil and spread over the tawa. Then spread the batter. Chop the onions really fine. Take a ladle of dosa batter and pour on the tawa, don't spread. Top it with lot of finely chopped onions. Sprinkle oil or ghee and cover with lid. Sim for a min. Then once its cooked, turn over and press well so that the raw batter beneath the onions come out and gets cooked. Simmer for 5 mins with lid. This will ensure the onions get really brown. Serve with your choice of chutneys. Alternatively you can sprinkle podi on the top once the oninos are cooked. That tastes heavenly.